Before I review the Colt Viper I want to offer a quick ammo alert to anyone who has purchased a Springfield EMP 9mm pistol. As you know from my earlier reviews I love this little pistol however, over the last couple of sessions it developed a problem of not firing when the trigger was pulled. 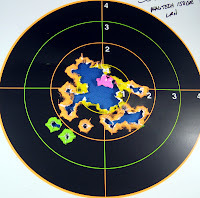 During these sessions I was using Remington 115 gr. FMJ, Mag Tech 115 gr. FMJ and Sellier & Bellot in 115 and 124 gr. FMJ ammo. After cleaning it I turned it over the Mike Dudley the Gunsmith at the Impact Guns range. Mike gave it the once over and tweaked the springs and reported that he had put several magazines through the pistol with no misfires. However the problem prevailed and I brought it right back into Mike’s workroom. 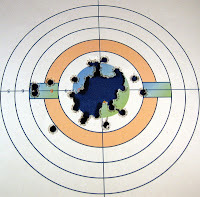 I went back to shooting my other handguns and a few minutes later Mike came into the range with the pistol and stated that there was a sliver of brass jammed into the firing pin hole. He had cleaned it out and reassembled the pistol. I loaded the magazine with the Sellier & Bellot 9mm ammo and fired the first round which slammed dead center into the target at 7 yards. However the next round only responded with a disappointing “click”. I ejected the round and gave it to Mike to examine and pulled the trigger again, “click” and “click” and “click”. I locked the slide back, dumped the magazine and turned the pistol over to Mike for his inspection. Another sliver of brass was clogging the firing pin hole. To make a long story short, the brass primers on the Sellier & Bellot ammo is so soft that the Springfield’s firing pin was puncturing it and ripping a sliver out. Mike explained that as the EMP was redesigned for the 9mm they shortened everything; in fact Springfield talks in their advertising about the “short action” they built for this pistol. As the firing pin and the rest of the action has been shortened they needed to put a correspondingly short but high tension spring in the action so that the firing pin could strike the primer with another force to make it fire. 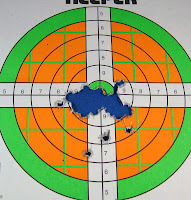 After cleaning the brass sliver out of the firing pin hole we fired 16 rounds of Winchester white box and 50 rounds of CCI Lawman 115 grain FMJ ammo with absolutely no problem---Whew! What a relief. I am very thankful that I am shooting at a range which has not only a competent gunsmith, but one who takes pride in his work and has a both a sense of curiosity and a keen interest in making them work. I am afraid that there are gunsmiths out there who would have said "That's all I can do, send it back to the factory". Fortunately Mike isn't one of those. Sellier & Bellot ammo is produced in Czechoslovakia (home of the fantastic CZ 75 line of firearms) and has recently turned up in great quantities at both Cabelas and Impact guns. The price of ammo has recently risen in this area to $8.99 for a box of 9mm. The Sellier & Bellot is priced one buck less so I picked up several boxes. When I was firing it along with the Remington and Mag Tech ammo I shot the Sellier & Bellot first. 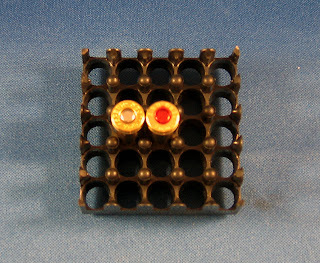 Once the piece of brass primer was clogging the firing pin hole the failures to launch occurred with all of the other ammo. In fairness, I put 250 rounds of the Sellier & Bellot through my EAA Witness Match Elite with no problem. It is just not a good choice for the EMP or probably any other ultra-compact pistol with an enhanced short action. 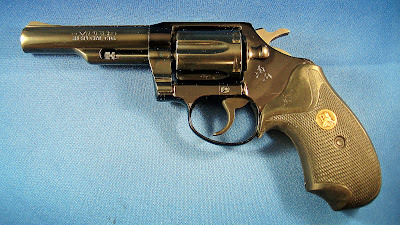 The Viper is a handy lightweight revolver produced on Colt’s small/medium “D” frame. This is the same frame size as their legendary Detective Special snubnose .38 revolver. This specimen came, once again, from Cliff (of Cliff’s Guns, Safes, and Reloading) in Boise. This firearm was a part of an auction lot of police confiscations that Cliff procured at a Dealer’s Gun Show. This one is a minty example in 98% condition or better. Quite frankly there was no indication that the revolver had ever been fired. I am finding some conflicting information about the Viper dates of manufacture. The Blue Book of Gun Values states that it was only manufactured in 1977 however Krause Publications “Pistols of the World” says it was manufactured from 1977 to 1984. Regardless of whoever is correct, the Viper was not manufactured in great quantities. While the Viper was not a popular choice at the time, it was produced at a time when Colt was making very fine revolvers and the quality shows on this piece. The lock work is exact, precise, and very tight, the bluing is a deep, mirror finish and the total revolver fits my hand like a glove. The Viper was a reduced weight revolver employing a carbon steel cylinder and barrel mounted to an aluminum frame. 1. In 1977 revolvers ruled the handgun roost. If you were a first time handgun buyer you probably left the gun shop with a revolver rather than a semi-automatic pistol. In those days semi-auto pistols were disdained by quite a few people as being inaccurate and unreliable. Although this should have worked in favor of the Viper it probably did not as the revolver rage at this time was for heavy framed stainless steel models not carbon steel finished in blue. 2. The other factor working against the Viper was probably the caliber.  The preferred revolver caliber in 1977 to 1984 was the venerable .357 magnum. Not many people actually carried .357 magnum cartridges in their .357 magnum revolvers. The most commonly carried cartridge for your Smith & Wesson model 66 was the .38 Special +P 125 grain semi-jacketed hollowpoint. Police departments fed these rounds into their 66’s by the millions and whatever the police use is usually very popular with the general public. Unfortunately for the Viper, the folks at Colt were not keen on the use of +P ammo in their aluminum framed revolvers. Fast forward to today when most states offer concealed carry rights and a lightweight revolver is considered a pretty handy tool. This is confirmed by the number of feather weight scandium/titanium revolvers in the Smith & Wesson line-up. The Viper is still pretty desirable when compared to the scandium revolvers currently catalogued by S&W today. The Viper is a small/medium framed handgun with a four-inch barrel. The four inch steel tube provides a longer sight radius and better recoil control over its 1.78 inch scandium competition built on Smith & Wesson’s small “J” frame. Smith does not make any lightweight medium “K” frame revolvers. The next size up is the medium-large “L” frame and, while they were able to squeeze a 7th round into the “L” frame’s cylinder it makes the “L” frame more difficult to conceal. The diameter of S&W’s “L” frame’s cylinder is 1.57 inches versus the 1.25 inches of the Colt “D” frame. So what are the drawbacks to the Viper? First and foremost it is the restriction against +P ammo. Nonetheless, a well placed .38 Special 158 grain hollowpoint at the short distances of most civilian armed encounters is hardly anything to sneeze at. The second consideration is the sights. The Viper sports fixed sights both front and rear with the front sight being of the very low ramped variety. While far from being target sights they are functional for its intended purpose as a short range defensive weapon. End Result? It is a lightweight, fairly small revolver in a good caliber with better than reasonable accuracy. What’s not to like?